After the Montreal Canadiens finished dead last in the Eastern Conference last season, team owner Geoff Molson knew it was time to make changes. He fired general manager Pierre Gauthier and hired Marc Bergevin – assistant GM of the Chicago Blackhawks, former NHL defenseman and longtime friend of Mario Lemieux – to take over. Bergevin has since made a number of crafty, smart decisions in his first year as a general manager, starting with the hiring of a face very familiar to Pens fans. Bergevin brought in Michel Therrien, who coached the Pens from 2005-09, to take over behind the bench for a second stint with the Canadiens after a three-year hiatus from coaching – and it’s a move that’s worked out surprisingly well. 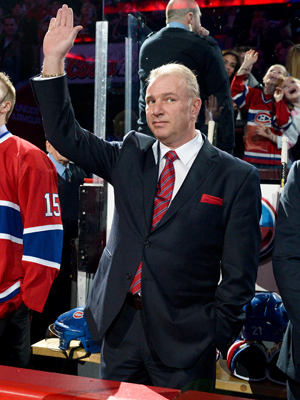 The Canadiens have responded to Therrien’s tough style and are thriving under him. They say Therrien has instilled a new team-first, winning attitude in a club that missed the playoffs last season – and has essentially the same players. Want an example of just how team-first the Canadiens are now? The Canadian Press reported that the club banned the "triple low-fives" victory celebration Carey Price and P.K. Subban used to perform after home wins in favor of a team salute to the fans. Right now, the Canadiens are on a 7-0-2 tear that has them in first place in the Eastern Conference. A big part of their success is their balanced attack. Different lines have been stepping up each night, and they have eight players with double digits in points and four players right at the precipice with nine points. Left winger Max Pacioretty leads with 16 points (6G-10A) in 16 games while longtime Hab Tomas Plekanec’s eight goals rank first on the team. Bergevin’s first draft pick, 19-year-old Alex Galchenyuk (taken No. 3 overall last June), has fit right in the lineup, while offseason acquisition Brandon Prust provides an edge. There is a new – old – face in Montreal’s lineup, as Bergevin sent veteran Erik Cole to Dallas on Tuesday for Michael Ryder – a Canadiens draft pick who spent his first four NHL seasons with the franchise. Ryder’s 14 points (6G-8A) now rank second in team scoring and he will be used on the power play. In addition to getting contributions from all four lines, Montreal has been playing strong defense. Like the Penguins, they want their defensemen to be involved, help them grind other teams down in the offensive zone and keep them from gaining their blue line. After holding out through training camp and the first six games of the regular season, top defenseman P.K. Subban is back on Montreal’s blue line and has nine points (3G-6A) in 14 games. 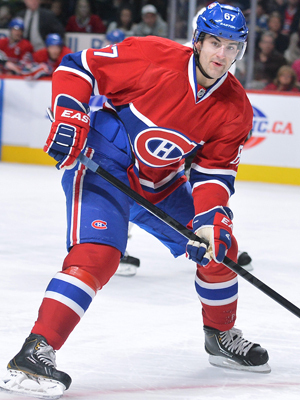 Raphael Diaz (1G-12A-13 points) and Andrei Markov (5G-7A-12P) are among the league’s top scoring D-men. However, Diaz suffered a concussion earlier this week and will not play Saturday. Tomas Kaberle will take his place in the lineup. But no matter how well the defense is playing, the goaltender must keep pucks out of the net – and Carey Price has been doing that. He’s been the star back there as he’s been lights out in goal for the Habs. He’s not seeing a huge volume of shots because of the Habs’ stingy D, but is making the needed saves. As a result, Price has an 11-3-2 record, a .924 save percentage and 1.90 goals-against average. Pacioretty knows how to put the puck in the back of the net. He’s the Canadiens’ leading scorer with 16 points in 16 games, and has actually scored all six of his goals in his last six games – meaning he’s hot after a cold start and some injury problems at the beginning of the season. But what the big winger is also adept at is agitating his opponents with his physicality. 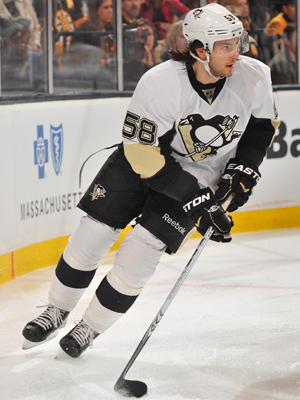 The Pens can’t get rattled by his tough style of play. The Penguins are displeased with the way they’ve performed the first two games of this three-game swing, especially around their net. All four of Carolina’s goals last game came from the same area – right around the blue paint. The Penguins MUST be infinitely better at their D-zone coverage and helping their goalie out Saturday in Montreal, especially against a Canadiens team that gets contributions from all four lines. They need top defenseman and Montreal native Kris Letang to step up and lead in that objective – especially with Paul Martin’s status unknown for the game. Letang has been strong at both ends of the ice, tied with Martin for second in scoring among NHL defensemen, and the Pens need a big game from him Saturday. Defenseman Mark Eaton will make his season debut for the Penguins on Saturday in Montreal, as Paul Martin will not play in the game. He is day-to-day with a lower-body injury, sustained Thursday against the Hurricanes. In addition, Penguins center Evgeni Malkin skated in Pittsburgh for roughly 30 minutes on Wednesday morning, which was the first time he's conducted physical activity since suffering a concussion on Friday, Feb. 22 in a game against the Florida Panthers. He then skated again on Thursday. He did not skate Friday or Saturday due to a lack of ice but did an off-ice workout Saturday. Malkin has missed the last 3 games.